It was quite a morning at the American Boating Congress. The 200-plus industry representatives who turned out for Thursday’s session heard from a popular, provocative political star, a senator with a big Sea Ray and a love of boating, a veteran White House correspondent who said President Obama is, in person, “very distant” and a Coast Guard rear admiral who just a week earlier had come under fire for publicly espousing his religious faith. 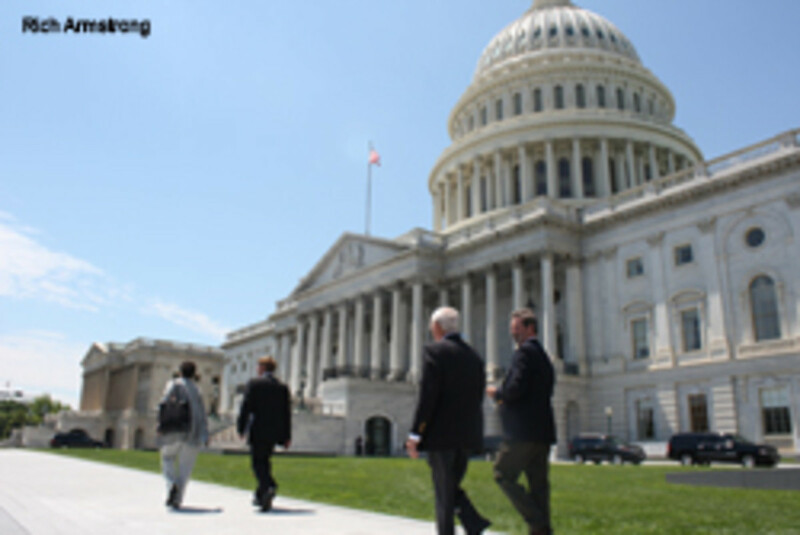 And after that, industry contingents conducted more than 250 Capitol Hill visits to discuss challenges to their industry, their businesses and their lifestyle with their representatives in Congress. What followed were talks by Sen. Joe Manchin, D-W.Va, a longtime boater who spoke of weekends on the water when "we never touched shore from Friday to Sunday," and Rep. Paul Ryan, R-Wis., who said the Affordable Care Act is a “train wreck” that will have dire consequences for small businesses. Manchin called the 54-foot Sea Ray he and his wife keep in D.C. in the summer “the most important part of our life” and said the boat serves as a useful political tool. Manchin said he has strongly opposed ethanol fuel blending and is confident that lawmakers will eventually halt the push for E15, the top priority at ABC. He also promised to fight restrictions on boating access in national parks. “Let’s keep our parks open for our citizens,” he said. On dredging, another ABC priority, Manchin said it is as important as ever to find ways to pay for projects that are critical to navigation. Manchin says he advocates for the industry as a revenue generator and a job creator. He offered reassurance, but Ryan addressed the ABC with dire warnings about the economy. Although he urged industry members to remain engaged in Washington — “It’s true what they say — out of sight, out of mind. You can’t just send in your check to the association” — Ryan spent much of his time painting a grim picture of a government in gridlock and another economic crisis on the horizon. “Our debt is hitting catastrophic highs and we’ll have a debt crisis just like Europe if we keep running down the same path,” he said. 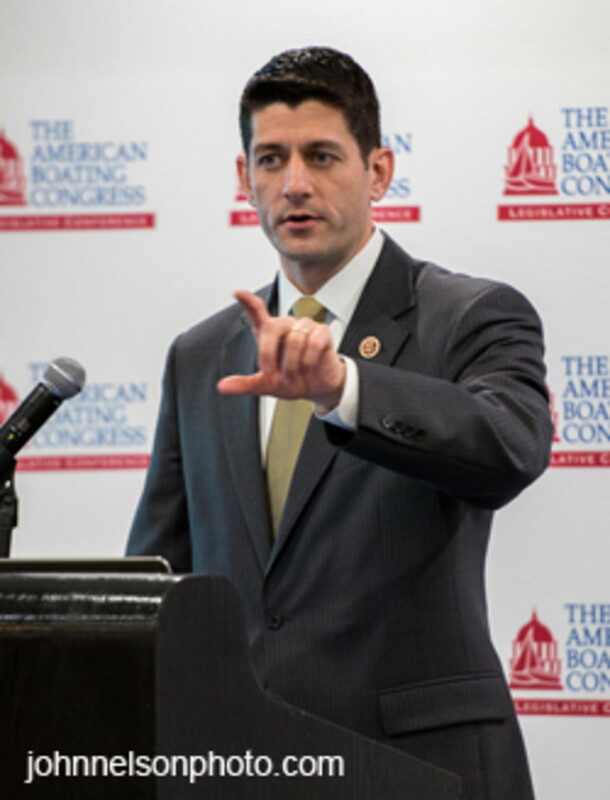 Ryan predicted that President Obama’s Affordable Care Act and its requirements for businesses are going to force the “competitive dumping” of employees’ health coverage for their own financial survival. The political discussion continued with Ken Walsh, chief White House correspondent for U.S. News & World Report. Walsh, who is covering his fifth president, said we can expect business-as-usual politics from the nation’s capital for some time.
? Coast Guard Rear Adm. William Lee, who assured conferees that no significant changes in the requirements for PFDs, EPIRBs and manufacturer model years are on the horizon.Lee also hinted that the controversy surrounding his National Day of Prayer speech a week earlier may cost him his job.
? On a lighter note, Frank Peterson, president and CEO of the Recreational Boating & Fishing Foundation, told the audience that “fishing from a boat is at its highest level in eight years” and that 7 million consumers visit the Take Me Fishing website each year.
? Deerin Babb-Brott, director of the National Ocean Council, spoke promisingly of the collaborative effort under way to develop marine-use plans for coastal regions around the nation. “The Northeast, Mid-Atlantic, Caribbean and Pacific islands are moving forward with marine plans, and I expect the Pacific Northwest and California to start the process by the end of the year,” he said. Look for a more comprehensive report on ABC in the June issue of Soundings Trade Only.